This article describes how to quickly set up a simple Azure Stream Analytics job that integrates Azure Machine Learning. 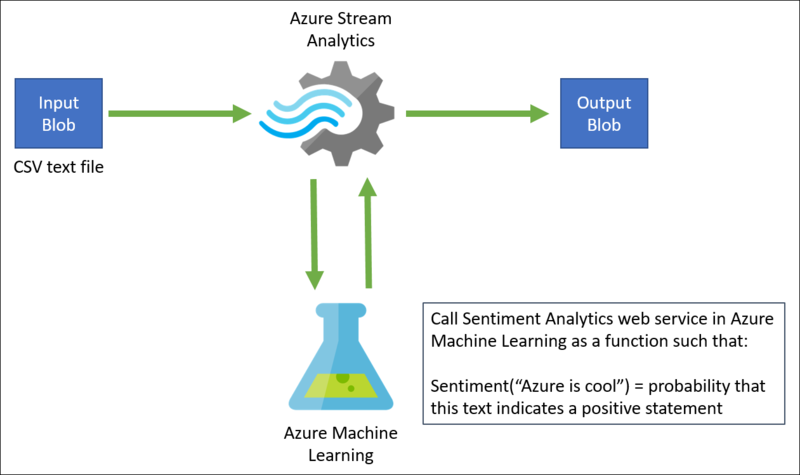 You use a Machine Learning sentiment analytics model from the Cortana Intelligence Gallery to analyze streaming text data and determine the sentiment score in real time. Using the Cortana Intelligence Suite lets you accomplish this task without worrying about the intricacies of building a sentiment analytics model. Analyzing real-time sentiment on streaming Twitter data. Analyzing records of customer chats with support staff. Evaluating comments on forums, blogs, and videos. Many other real-time, predictive scoring scenarios. The Streaming Analytics job that you create applies the sentiment analytics model as a user-defined function (UDF) on the sample text data from the blob store. The output (the result of the sentiment analysis) is written to the same blob store in a different CSV file. The following figure demonstrates this configuration. 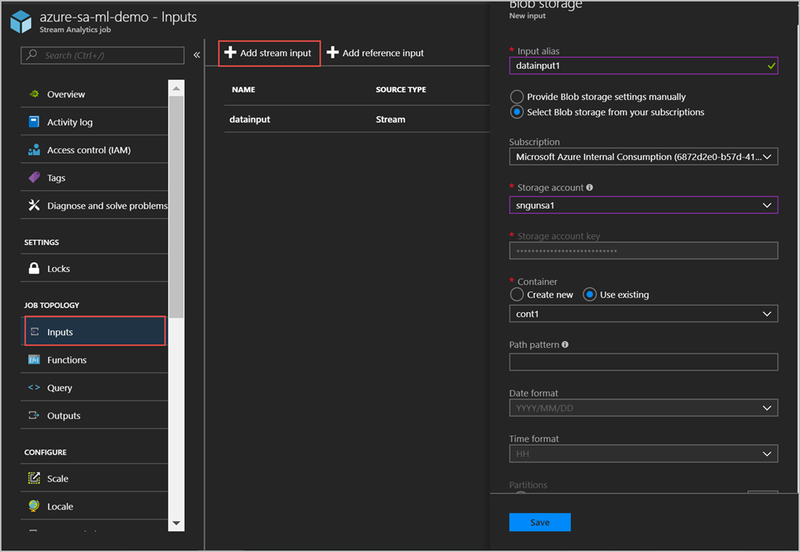 As noted, for a more realistic scenario, you can replace blob storage with streaming Twitter data from an Azure Event Hubs input. Additionally, you could build a Microsoft Power BI real-time visualization of the aggregate sentiment. A CSV file with some data in it. You can download the file shown earlier from GitHub, or you can create your own file. For this article, it is assumed that you're using the file from GitHub. 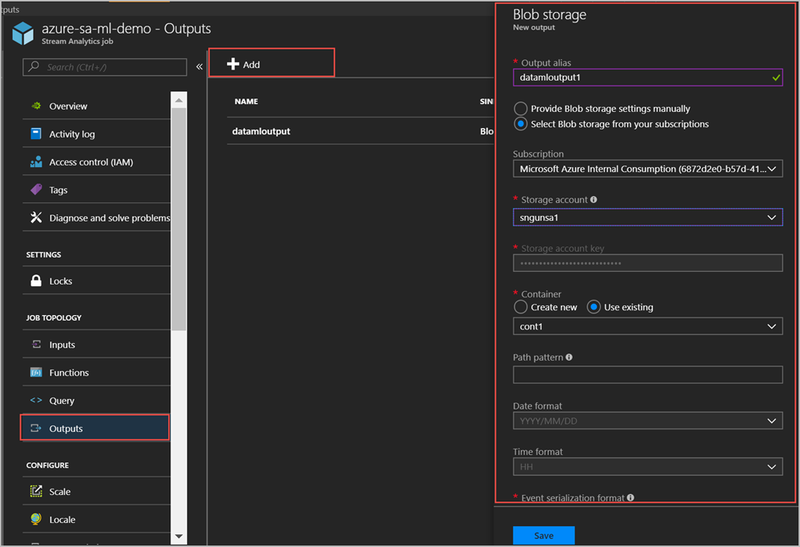 Create an Azure storage account and a blob storage container, and upload a CSV-formatted input file to the container. 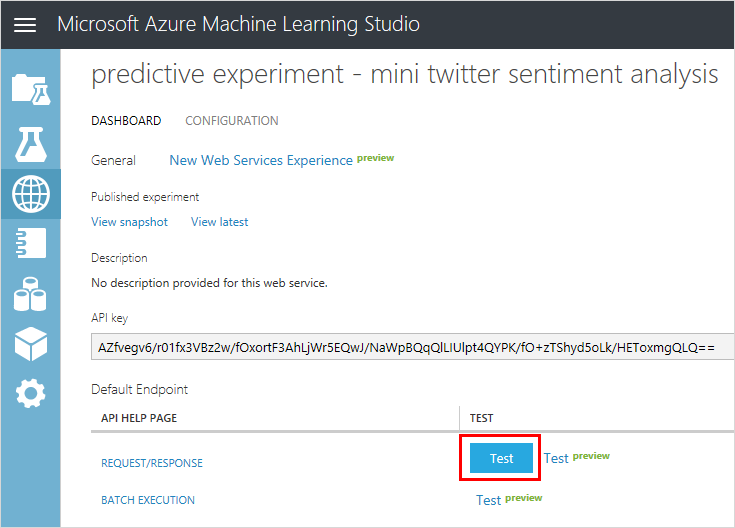 Add a sentiment analytics model from the Cortana Intelligence Gallery to your Azure Machine Learning workspace and deploy this model as a web service in the Machine Learning workspace. Create a Stream Analytics job that calls this web service as a function in order to determine sentiment for the text input. Start the Stream Analytics job and check the output. For this step, you can use any CSV file, such as the one available from GitHub. 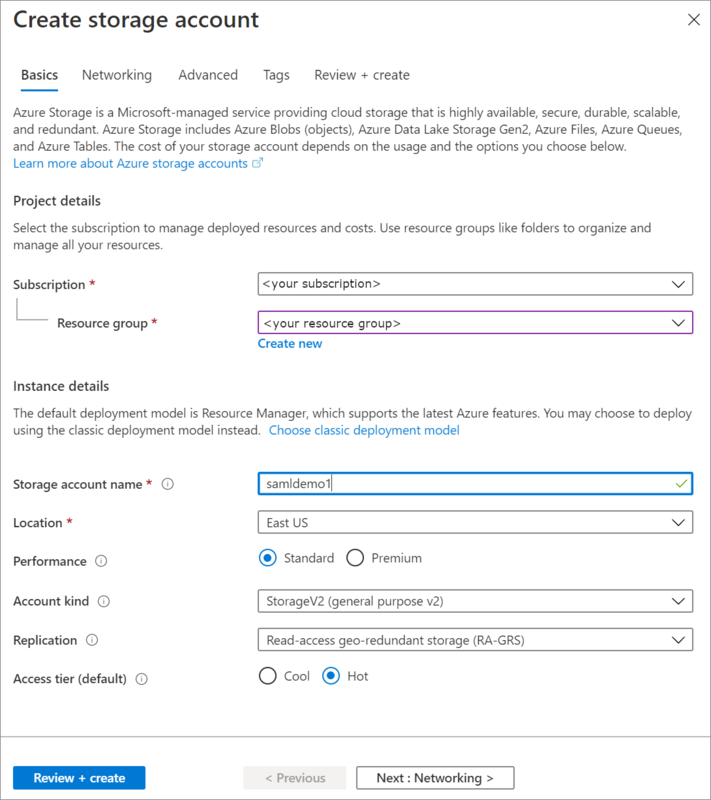 In the Azure portal, click Create a resource > Storage > Storage account. Provide a name (samldemo in the example). The name can use only lowercase letters and numbers, and it must be unique across Azure. Specify an existing resource group and specify a location. For location, we recommend that all the resources created in this tutorial use the same location. In the Azure portal, select the storage account. In the storage account blade, click Containers and then click + Container to create blob storage. 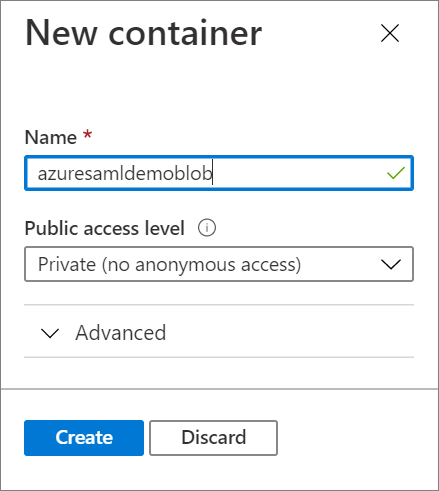 Provide a name for the container (azuresamldemoblob in the example) and verify that Access type is set to Blob. When you're done, click OK. In the Containers blade, select the new container, which opens the blade for that container. In the Upload blob blade, upload the sampleinput.csv file that you downloaded earlier. For Blob type, select Block blob and set the block size to 4 MB, which is sufficient for this tutorial. Click the Upload button at the bottom of the blade. 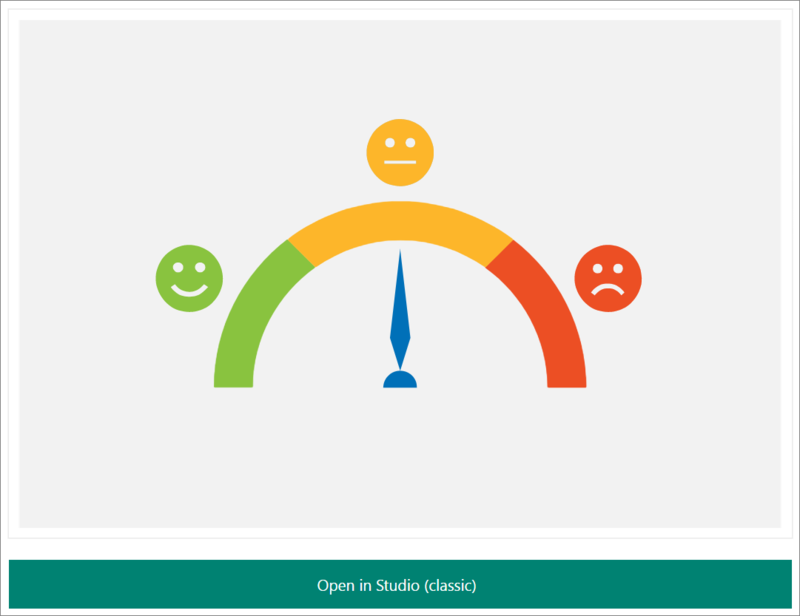 Now that the sample data is in a blob, you can enable the sentiment analysis model in Cortana Intelligence Gallery. Go to the predictive sentiment analytics model page in the Cortana Intelligence Gallery. Sign in to go to the workspace. Select a location. Click Run at the bottom of the page. The process runs, which takes about a minute. After the process has run successfully, select Deploy Web Service at the bottom of the page. To validate that the sentiment analytics model is ready to use, click the Test button. Provide text input such as "I love Microsoft". In the Apps column, click the Excel 2010 or earlier workbook link to download an Excel workbook. The workbook contains the API key and the URL that you need later to set up the Stream Analytics job. You can now create a Stream Analytics job that reads the sample tweets from the CSV file in blob storage. Go to the Azure portal. Click Create a resource > Internet of Things > Stream Analytics job. 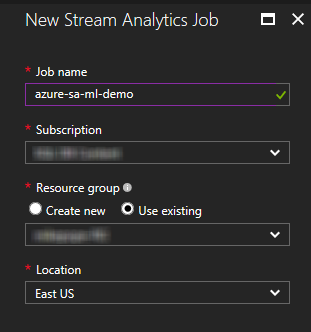 Name the job azure-sa-ml-demo, specify a subscription, specify an existing resource group or create a new one, and select the location for the job. The job gets its input from the CSV file that you uploaded earlier to blob storage. After the job has been created, under Job Topology in the job blade, click the Inputs option. Storage account Select the storage account you created earlier. The job sends results to the same blob storage where it gets input. Under Job Topology in the job blade, click the Outputs option. In the Outputs blade, click Add >Blob storage, and then add an output with the alias datamloutput. Earlier you published a Machine Learning model to a web service. In this scenario, when the Stream Analysis job runs, it sends each sample tweet from the input to the web service for sentiment analysis. The Machine Learning web service returns a sentiment (positive, neutral, or negative) and a probability of the tweet being positive. In this section of the tutorial, you define a function in the Stream Analysis job. The function can be invoked to send a tweet to the web service and get the response back. Make sure you have the web service URL and API key that you downloaded earlier in the Excel workbook. 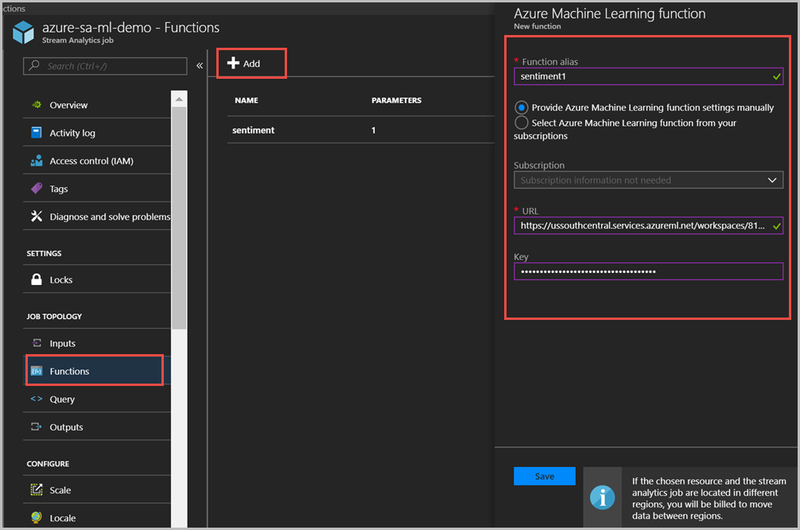 Function alias Use the name sentiment and select Provide Azure Machine Learning function settings manually which gives you an option to enter the URL and key. URL Paste the web service URL. Key Paste the API key. Stream Analytics uses a declarative, SQL-based query to examine the input and process it. In this section, you create a query that reads each tweet from input and then invokes the Machine Learning function to perform sentiment analysis. The query then sends the result to the output that you defined (blob storage). Return to the job overview blade. Under Job Topology, click the Query box. The query invokes the function you created earlier (sentiment) in order to perform sentiment analysis on each tweet in the input. Click Save to save the query. You can now start the Stream Analytics job. Click Start at the top of the blade. In the Start job, select Custom, and then select one day prior to when you uploaded the CSV file to blob storage. When you're done, click Start. Let the job run for a few minutes until you see activity in the Monitoring box. 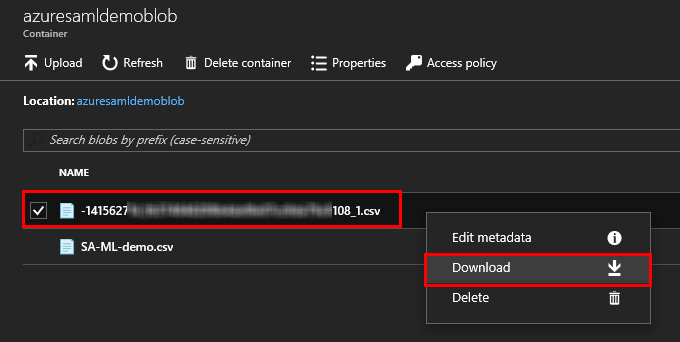 In the portal, find the samldemo storage account, and within the account, find the azuresamldemoblob container. You see two files in the container: the file that contains the sample tweets and a CSV file generated by the Stream Analytics job. Right-click the generated file and then select Download. Function Requests indicates the number of requests sent to a Machine Learning web service. Function Events indicates the number of events in the request. By default, each request to a Machine Learning web service contains up to 1,000 events.